The Pennsylvania Academy of Family Physicians is more than just an association of medical professionals. It is an organization with a singular goal: better patient care. It's right there in our mission statement, it's on the mind of Pennsylvania's thousands of family physicians, and it's the purpose for everything we do - from our public health efforts to our educational seminars. WHY SHOULD YOU CARE ABOUT FAMILY PHYSICIANS? When you think of the term "doctor," chances are good you're thinking of a family physician, the cornerstone of America's health care system. It's been proven time and time again that a strong primary care base leads to healthier, happier patients and lower-cost, higher-quality care. In a world where the price of everything seems to be rising - while quality is in a free fall - family physicians want to make sure you're getting as much out of your care as you possibly can. Moreover, family physicians didn't decide on their careers because they thought it would lead to fame and fortune - they're family physicians because they care about their patients. Family physicians treat people, not problems. They care for all their patients' needs - including their physical, emotional, behavioral, social, and cultural needs. That's why Americans turn to their family physician more often than any other medical professional. HERE'S WHAT OUR PHYSICIANS ARE SAYING ABOUT YOU. 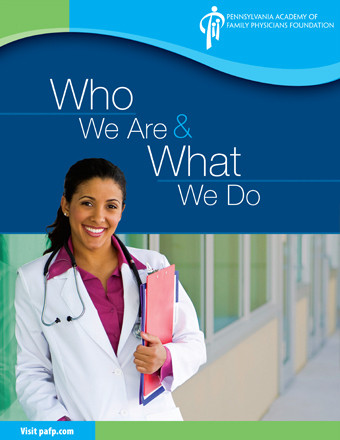 You can learn more about Pennsylvania's family physicians by clicking the brochure below. Within its pages, you'll find out why most Pennsylvanians (and Americans) rely on family physicians; what makes family physicians uniquely qualified to take care of the "whole person"; how family physicians advocate for their patients; and the role the Pennsylvania Academy of Family Physicians plays in family medicine in the Commonwealth. PAFP is a member organization serving family physicians in Pennsylvania and is the state chapter of the American Academy of Family Physicians (AAFP). The AAFP has developed a special website just for patients. On FamilyDoctor.org, you'll find information about diseases, conditions, health and wellness, and many more topics, as well as a directory of family physicians across the United States. Click on the logo for access to the site. Find a family physician near you in Pennsylvania! Simply click here to get started! Below, you'll find a table of the PAFP's various departments and how they are working with family physicians across the state to improve patient care. The PAFP's communications department helps to foster a dialogue between family physicians and patients through in-house communications efforts and traditional and social media outreach. The education arm of the PAFP makes sure that family physicians stay up-to-date on all of the latest research and procedures through various types of educational seminars, webcasts and events. The PAFP's government affairs team advocates on behalf of family physicians and their patients. It works with members of the Pennsylvania legislature on important solutions to health care problems. Public health is one of the PAFP's most important teams. It ensures that Pennsylvania's patients are well cared-for and aware of diseases, conditions and health risks that affect large populations. The Quality Improvement department is how the PAFP is improving patients' quality of care. This team researches and implements novel, innovative methods of quality and cost-efficient patient care. Doctors need a lot of training! The PAFP's Residents and Students team provides valuable support, including education, grants, and various scholarships, to make the schooling a bit easier.